Renton, one of our neighboring towns to the south. Once one of the big boom towns in the Puget Sound region because of the coal industry. Becoming part of the boom-and-bust cycle of Boeing. Whose factories and HQ are located in and around it. Naturally, there are many diverse neighborhoods within Renton. As a whole, it is still very much a commuter town. One that requires a car in most cases. Old Renton's core of retail and dining sets itself apart from the large shopping center, The Landing. 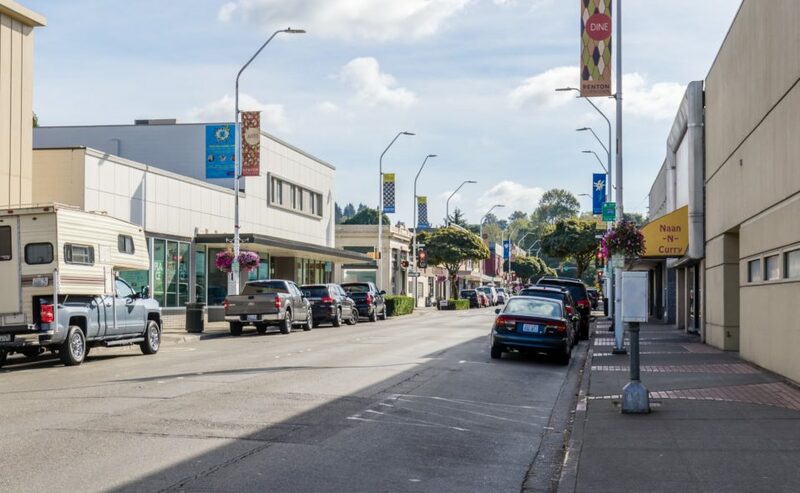 Renton is still defining itself as it grows and absorbs new populations. It already has some wonderfully unique features already. The Renton Library straddles the Cedar River. You can look down through its large windows and see the salmon making their way upstream in the autumn. Then go see the fall colors in the adjacent Liberty Park. St. Charles Place Antiques: We love this long-running, family-owned antique shop in the historic downtown. Liberty Cafe: A cozy cafe on the edge of the historic downtown with bistro fare, free Wi-Fi and open-mic nights. Liberty Park: A playground, skatepark, cherry trees and access to the Cedar River Trails make this an active destination year-round. Blossom Vegetarian: A beloved diner run by chef and Buddhist Nun, Hue Phan, featuring traditional Vietnamese food served vegetarian. Berliner Pub: A traditional beer garden, including outdoor and communal seating, rare brews, and live entertainment on some nights.